Arrival this morning at Tokyo Narita. A bad start. British Airways didn't feel the need to put our luggage on board, so it will be delivered to the hotel tomorrow. If they can manage it. If it does arrive, it might even be worth the £35 each compensation they gave us. At least we travelled light on the metro, which as you would expect is extensive and a bit confusing as there are different companies.First impressions are good, we've had plenty of locals with varying degrees of English offering to help with directions. The hotel has the smallest double room I've ever seen. Reading is going to be a challenge, the apple juice I bought at the corner shop turned out to be cold green tea. Avoid at all costs. Luggage arrived, all is forgiven BA. Thanks for the £35. 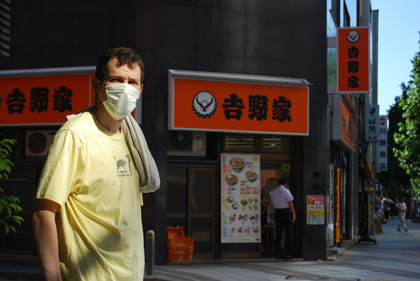 A lot of people use these masks to protect against Tokyo's pollution. Hopefully it will save my sinuses. 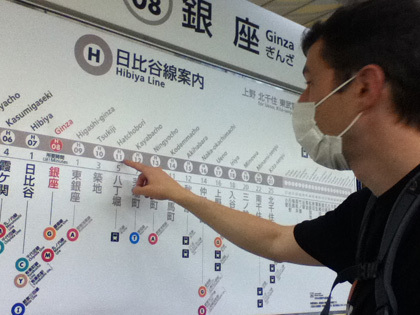 Every station on a Tokyo metro line is numbered, making them very easy to locate, to know which direction you should take and how many stops till you reach your destination. If you buy the wrong ticket, you can use the fare adjustment machine to pay the deficit before you exit. Apart from the two companies issue, it's extremely easy to use. Fruit is not easily available and today we were charged ¥1,780 (about €18) for two peaches and two apples. We told him we didn't have enough money and put them back. Looks like fruit isn't part of the staple diet in Japan. Here people give and receive everything with both hands. It's a tough one to remember. Yesterday we took the train from Tokyo to Fujiyoshida, the small town at the foot of Mt.Fuji. Our train pass, the Seishun 18 only covers local trains, which are slower but more affordable. The air is cleaner here, so I've jettisoned the dust mask for now. 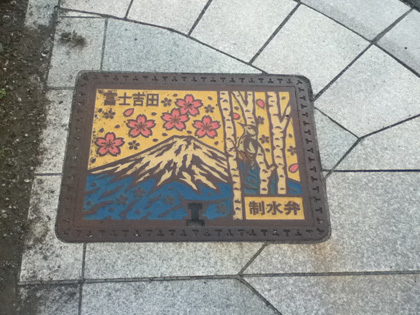 Decorated manhole covers in Fujiyoshida. 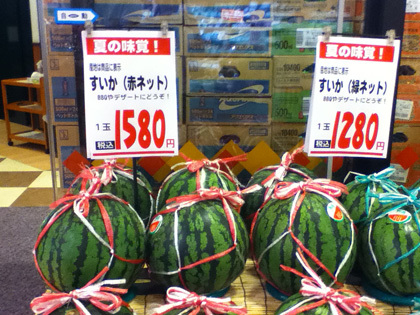 Today's bargain - ¥1,580 for a watermelon. 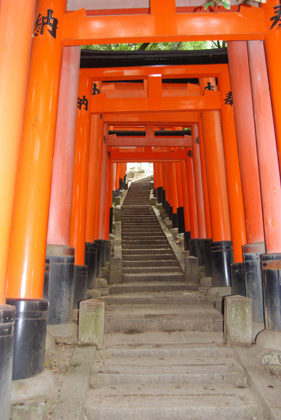 There's an impressive Shinto shrine,the Sengen Shrine, which marks the traditional starting point for climbing Mt.Fuji, or Fujisan as the Japanese call it. Town of c240,000 population in the Nagano Prefecture. There are a lot of things to see here, the main attraction being the late 16th century castle. The Timepiece museum and Scale museum were surprisingly interesting. The town is compact and easily covered on foot. Though not so easy with temperatures in the mid 30s. Japan does not observe daylight savings time, so even though it's early August, it's dark here by 7pm, but bright by 5am. By chance we were here for the local festival, which involved countless groups dressed in their colours and parading while performing a kind of cross between the Macarena and the Haka. It was impressive that so many people got involved, especially compared to similar events at home. 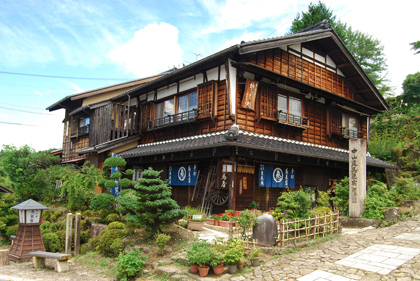 We visited the towns of Magome and Tsumago, two restored Edo era villages. The hike between the towns on an old trail took about 2.5 hours, plus another hour to Nagiso train station as we missed the bus from Tsumago. The villages are well maintained and well worth a visit, though it's a bit disappointing that most of the buildings along the main streets are shops, all selling the same crafts, sweets and sake. The hike is also highly recommended as it gives an opportunity to see the nature, and also some houses and farms, including paddy fields along the trail. 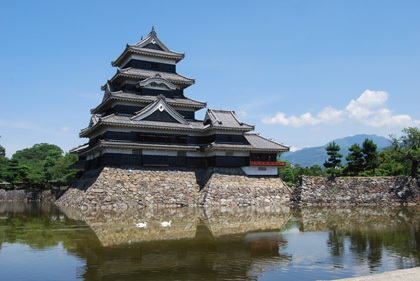 Matsumoto to Kyoto was a long haul, seven hours and four transfers on the JR local trains. It's still hot (35c today), and also more humid than Matsumoto. Indoors, or on trains, you're likely to be greeted with ferocious air conditioning, thereby neatly swapping one problem for another. "Some people say this has Chinese influence" said the guide, "but how can that be when they use red columns and we use orange?" Hard to argue with that defence. The Palace was disappointing, a wooden tour guide, no entry to any building and access to only half the grounds. 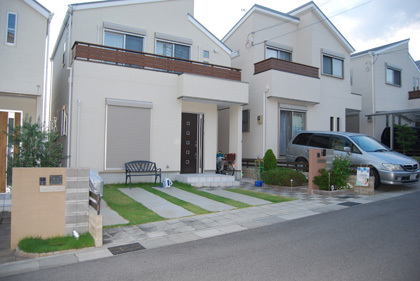 Japan is surely the cleanest country I've been to, though strangely there are few bins on the streets. Obviously the Japanese have managed to instil people with a sense of ownership of, and pride in public spaces, which we don't have. Or maybe litter-bugs are just beaten senseless. Here we are staying in a B&B style accommodation with one of those Asian style 30cm high tables. It's torture for a westerner, unless you happen to be a gymnast or a yoga instructor. My physio will be happy. The shrines and maze of covered walkways around the woods at Inari were a highlight of an otherwise disappointing Kyoto. Just a short train ride from Kyoto. 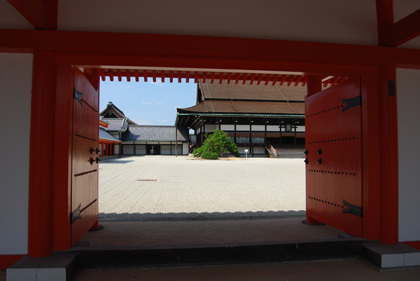 Like Kyoto, a former capital of Japan. 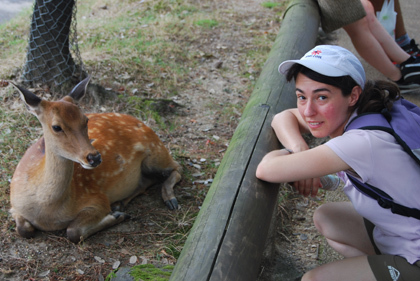 Now famous for Buddha statues and deer. A huge herd of semi-pet deer with the freedom to roam all over creation. 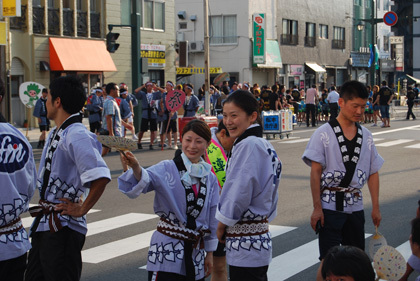 It's Obon festival this week, so the town is packed with tourists. The parks and lakes have been illuminated by candles, creating a lovely atmosphere. Unfortunately a nasty thunderstorm hit at around 8 o' clock, ensuring everyone forked out a few hundred Yen on an umbrella, or got a good soaking. Or both. Due to the huge numbers of people travelling around Japan this week, we decided to abandon the JR local trains and take the Shinkansen, Japan's famous Bullet Train from Kyoto to Tokyo. It's a major step up in quality and speed, taking around 2.5hrs, compared to 8hrs on the local train, plus up to seven transfers. 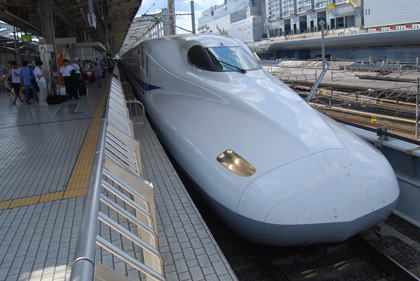 At top speeds of just under 300km/h, the Hikari is not the quickest Bullet Train, but has a capacity of 1,323 and up to thirteen per hour run from Osaka to Tokyo. This is after all, one of the world's most densely populated regions. On the whole, we found Japan to be a very positive experience. Japanese people are extremely polite and helpful, and speak better English than I had expected - which is to say, enough to get by - fluent speakers are certainly not so common. Public transport, in particular the rail system, is fast, frequent, easy to negotiate and has a range of services from reasonably priced local trains, to the luxurious Shinkansen. While certain products can be very expensive, the basics such as food and accommodation are not. This is a blog of my travel diaries. Feel free to comment. Don't forget to put your name!